Sophos Email is a secure email gateway engineered to keep businesses safe from all email threats. It simply stops spam, phishing, malware and data loss and keeps your people productive. And if want to consolidate protection it lets you control email security alongside endpoint, mobile, web, and wireless protection from Sophos Central’s single interface. Simply secure Microsoft Exchange, Office 365, and G Suite Shifting your email to the cloud doesn’t mean you have to reduce your security. Securing your email server or service with Sophos Email ensures you get trusted email security powered by the SophosLabs global network. And, you get the reassurance of continuity in the event of disruption to Microsoft or Google services. 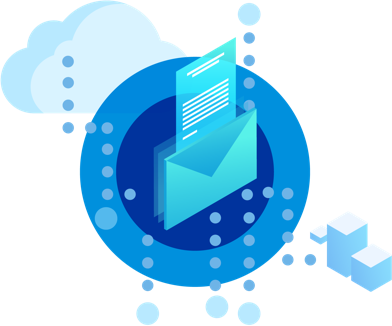 Ensure your email is always on When your email server experiences an outage or there’s a disruption to a cloud-based service, Sophos Email automatically queues all incoming mail until the server comes back online. When the service comes back online, all queued mail is delivered, safe and sound. You get automatic alerts, spooling to ensure no mail is ever lost, and an emergency inbox to keep your users productive. 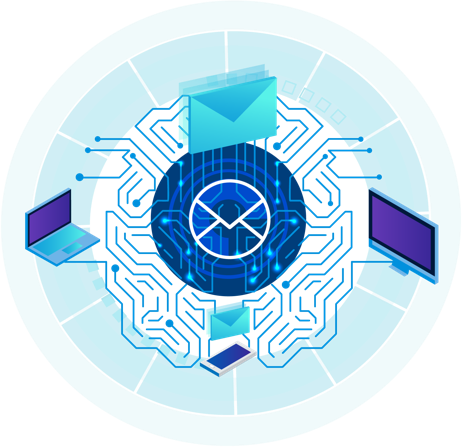 Sophos Email is email security delivered simply through Sophos Central’s easy-to-use single management console, protecting your users from unwanted and malicious email threats today, and tomorrow, with the latest artificial intelligence to defend against ransomware and zero-day malware. Secure sensitive data and make compliance easy, with easy-to-use secure email encryption from Sophos. Converting a standard email into one with encrypted attachments - sent direct to the recipient’s inbox. 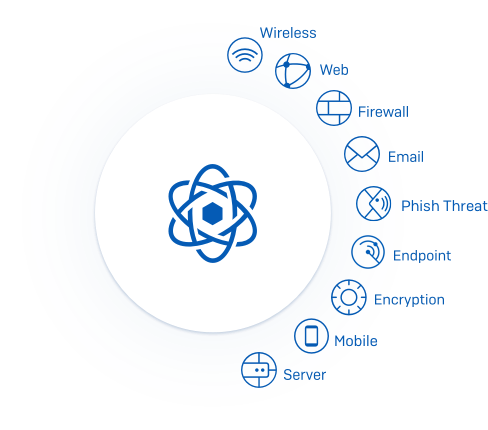 The new Sophos Email Advanced ‘At Risk Users’ report highlights exactly which users are clicking email links re-written by Time-of-Click URL protection. This identifies users who have either been warned or blocked from visiting a website due to its risk profile. You’re then simply one click from the report to enroll users in Phish Threat simulations and security awareness training – increasing their threat awareness and reducing risk. Finding specific user mailboxes is now a simple task with the new Mailbox Search feature within the ‘Mailboxes’ menu option. Today’s email threats move fast, and growing businesses need predictive email security – defeating today’s threats with an eye on tomorrow. Time-of-click URL protection checks the website reputation of email links before delivery and also when you click – blocking stealthy, delayed attacks. Block phishing imposters and protect employees from attacks using fraudulent email addresses that impersonate trusted contacts. A combination of SPF, DKIM, and DMARC authentication techniques and email header analysis allows you to identify and permit legitimate emails, while blocking imposters – so you can trust your inbox again. Microsoft Office 365 security features often don’t live up to expectations. Great collaboration needs great security, and Sophos Email provides a simple solution. Advanced email security with simple management doesn’t stop at Sophos Email in the cloud. 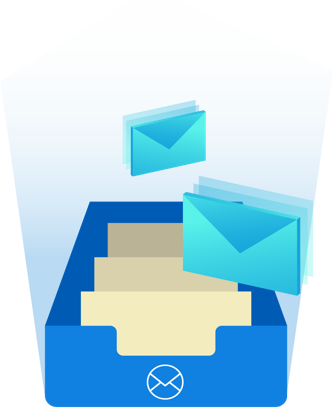 The Sophos Email Appliance offers all-in-one control of encryption, DLP, anti-spam, and advanced threat protection. Available as dedicated hardware or virtual machine to suite your business. Processing five million emails per day, SophosLabs global network ensures your Sophos Email gateway won’t miss any of the thousands of new threats discovered every hour. 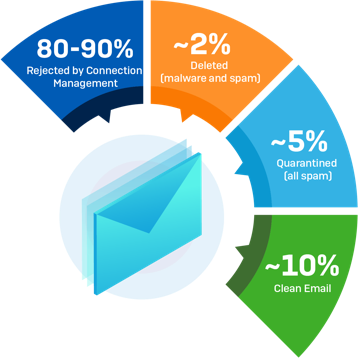 Sophos Email is email security delivered simply through Sophos Central’s easy-to-use single management console, protecting your people from unwanted and malicious email threats today, and tomorrow, with the latest artificial intelligence to protect against ransomware and zero-day malware. That’s why Sophos Synchronized Security now connects Sophos Email with Sophos Endpoint, delivering automatic detection and cleanup of infected computers sending outbound spam and viruses.